I love textures and I think texture makers don't get enough credit in SL for what they do. We can't make stuff look good without good textures and there are some really good texture shops out there. 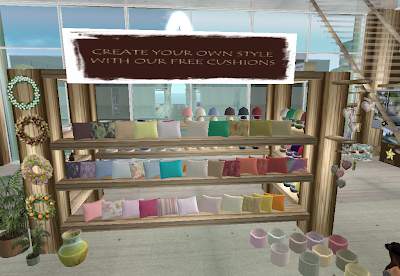 Not only do texture makers not get enough credit in SL they take a HUGE risk selling their textures in SL. In order for their product to get used they have to sell it full perm which puts them at risk for some unscrupulous person to resell what they make. 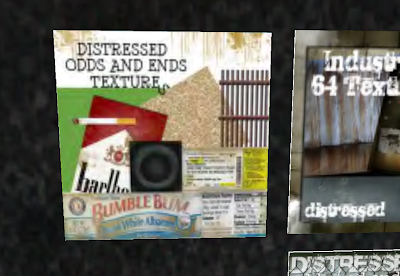 One of my favorite texture shops is Distressed Textures which is owned by Jewell Lamourfou. Once you get familiar with her work, you will notice that it is used alot in furniture and homes. I don't know what she does to her stuff in Photoshop but it ends up looking amazing! When you go inside of the shop, you will notice she has an assortment of fabric, wood, glass and many other types of textures for sale. One of her most creative texture packs are this one with various labels that you can use in your creations. I haven't been able to find anything else like it in SL or exchange. Well, I am not very good in keeping up with this blog because I live a pretty dull existence in SL but in my attempt to make furniture, I have learned alot...a whole lot! I mentioned earlier that PIMP is closing down and I will be leaving there in about 30days. So I have been looking at land and shops and have discovered a lot of furniture stores out there that I have never even heard of. Some good and some bad and some in between. I have also developed an interest in textures. Texture makers in my holy opinion are some of the unsung heroes of SL! I mean you can't make stuff with out them and unless you are multi-talented we need them! So the focus of my blog for the future will be on furniture, homes, texture shops, building gadgets etc., that I have discovered and will discover as I search the grid. I am hoping to update this at least once a week with something new. The first furniture shop that I want to feature is KaiaGaia. I happened to stumble upon this place when I was looking at another very, very small furniture store. The thing that struck me about the store was it's open, earthy feel and the consistency and look of the place. As a matter of fact, the theme of the store is Earth, Air, Fire and Water. One of the shop's selling points are the free cushions that are available. There are no animations in them but they are cute! Some of my favorite things at this shop are the kitchens. I think the cabinets and the colors and set ups are some of the cutest that I have seen. The sinks even have a cute hand washing feature on them! I also saw these cute heart windchimes that look so real with their ceramic texture. Last but not least my favorite thing from the shop and that I have in my own office is the cute Beechwood desk set with a typing animation. Well, it was fun while it lasted! I just received a note from PIMP where I have one of my little stores that they are no longer going to be doing retail there. We have until the end of our payment term and then we need to move the HELL out! JK..they were not that mean about it! LOL! So, my plans to patiently take over every single little shop on the SIM to build a massive furniture empire on the cheap is over! As they say, if it is too good to be true then it probably is! So, my furniture shop plans are on hold. I still have the little shop on Conatus that Noel is helping me out with but unfortunately, I like to make furniture and furniture requires a lot of space with a lot of prims which requires a lot of cash! I am thinking for now I will just make it and put it on exchange and keep my group information in case I find another location and then start it up again. Honestly, it is kind of a relief. It takes a lot of time to make stuff and then learn a new skill and then second guess the quality of your work over and over and over again! I don't care how idiot proof they say some gadget is like Perfect Sitter! Hello, you are meeting the one idiot out there in SL who will run into problems with it! It is never as easy as "Just drop the script in and go" It will take me days of pulling out my hair to figure out the darn thing! Does anyone else have that problem? I finally finished my first bedroom set! Whew! I had some QC help from my friend Casandra Shilova and ta da...it is complete! Thank you Casandra! So I decided to name my first set after my friend Laleeta Xue, http://pffiou.blogspot.com/, because she was so excited and supportive of me getting into the furniture business. 1. It is only 42 prims. You can make it more or less since everything is copy. Also, if you buy as a set there is an extra 2-prim nightstand if you need to save some prims. 2. It is only $250. You can buy the pieces separately but it is cheaper as a set. 3. The Twilight posters are up for free in my shop if you would like just those. 4. The bench has two menu operated poses and the little black pillow does switch to a red texture. 5. The bed has five menu operated poses in each pillow. They are the same poses and they are simple sleep and sit poses. 6. The little heart pillow on the bed and the baskets also have two texture changes. 7. The lamp switches off and on with a click. 8. The candles blow out with a touch. Please stop by either my location at http://slurl.com/secondlife/Conatus/190/106/40 or at http://slurl.com/secondlife/My%20Playground/147/124/22.